After looking at the US Fed's and the Bank of Japan's (BOJ) balance sheets a while ago, it seemed logical to also dig a bit deeper into the balance sheets of the European Central Bank (ECB) and the Bank of England (BOE). After all, these four are the principal central banks that have engaged in some form of quantitative easing, so looking at their balance sheets should bring to light some interesting similarities and differences. 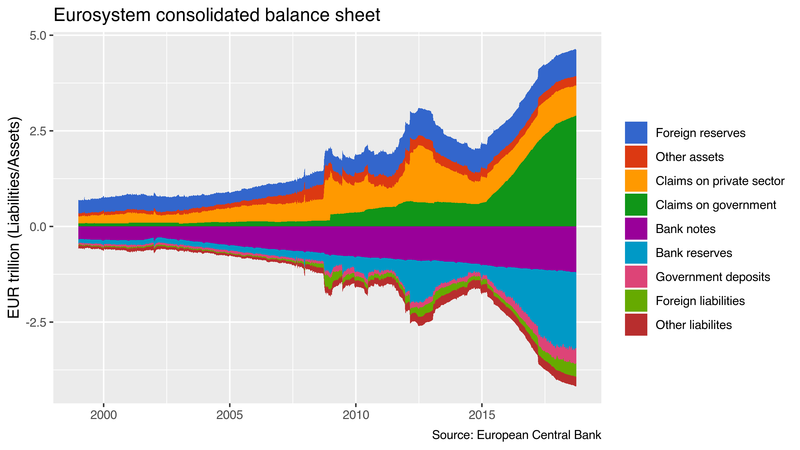 Data on the ECB's balance sheet is available from the ECB's Statistical Data Warehouse. Data on the BOE's balance sheet is available from the BOE's database. Both are covered by the pdfetch package, but unfortunately weekly data isn't supported for the ECB, so I used the ecb package instead. Plotting the ECBs balance sheet was fairly straightforward, thanks to the documentation available on the ECB's homepage. As with the US Fed and the BOJ, I group items into categories roughly corresponding used by International Monetary Fund (IMF) in its International Financial Statistics and plot them using ggplot2 and plotly. Disentangling the BOE's balance sheet is a little bit more involved. 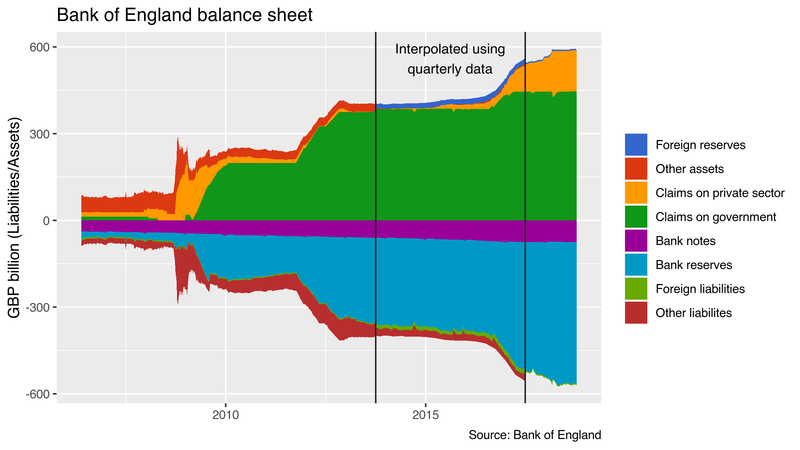 The BOE used to publish its full balance sheet in its weekly 'Bank return' but changed the presentation of the data following the BOE money market reform in May 2006. In September 2014 the format of the data changed again when the BOE introduced its 'Weekly Report', which covers some balance sheet items in greater detail but omits others that will henceforth only be shown at quarterly frequency and with a 5-quarter delay. We therefore look at data from 2006 onward (as this will still allow us to trace the effects of the BOE's Quantitative Easing programme) and interpolate quarterly to weekly values using zoo's na.approx() function where necessary. Finally, we split up the asset item 'Loans to Asset Purchase Facility' by disentinguishing holdings of government bonds ('gilts') from loans to the private sector (e.g. the BOE's 'Term Funding Scheme').